Well, this is what I have been up to for the past week! 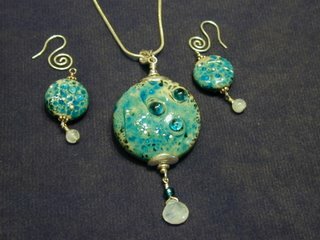 I have a couple of places that might want to carry my jewelry, so I have been trying to get some made! 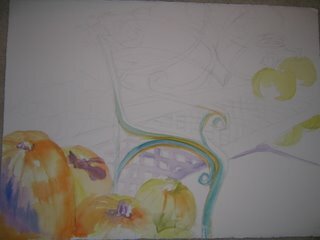 I am stressed though, as I am behind on the Pavillion and I have a comission painting that needs finishing. 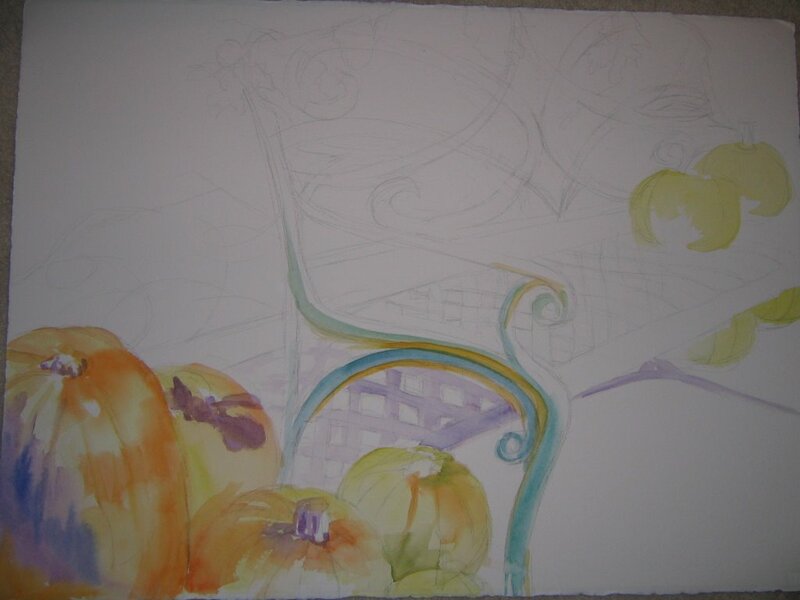 I also still haven't finished my pumpkin patch watercolor either! 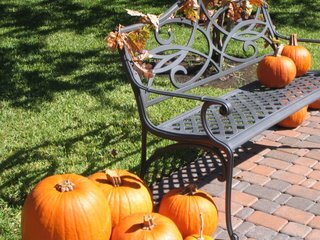 Tuesday I painted with The Woodlands Art league at a "pumpkin patch " that the Methodist church had set up in their courtyard. It was quite inspiring. Here is what I started and the photo of what I was painting from. I met a new friend at the Market Street show, Kim Carlton, who told me about the paintouts and invited me to join. It was really fun and there are some very good painters that participate. I think I will probably learn some things! 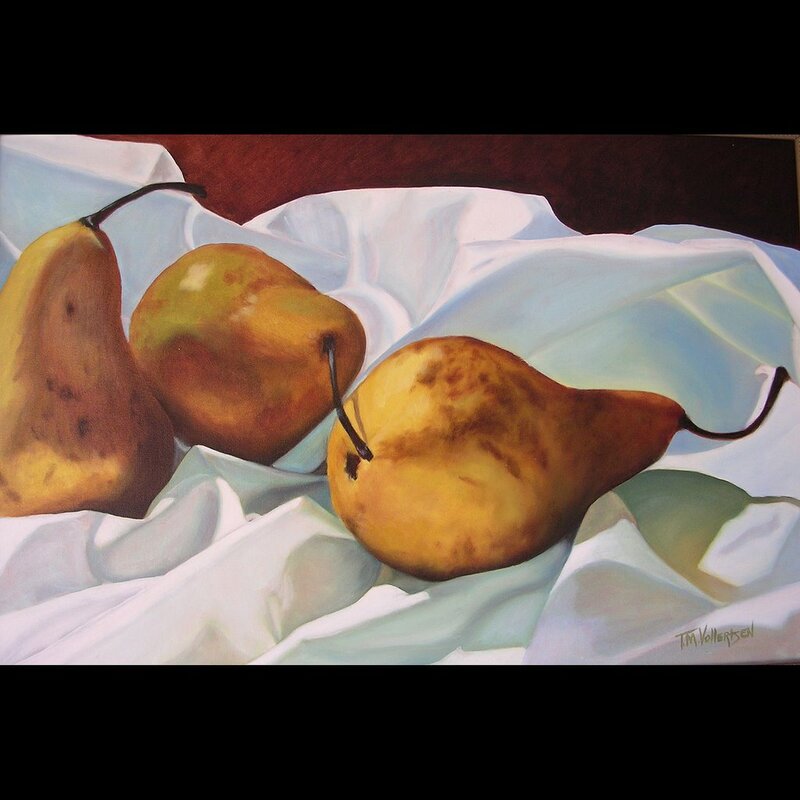 Kim and some of the others work in oils in an ala prima style which is something I would love to learn to do. I just ordered the Richard Schmidt book, 'Ala Prima, Everything I know about painting', which just came out in paperback. The hard back version is 75 dollars and this new version is much more afordable. I love his work and am excited to get the book. 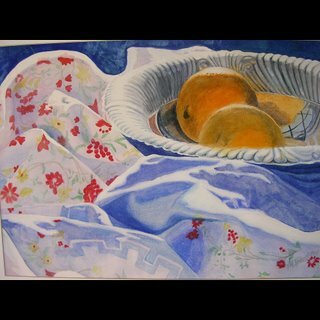 I have worked in oils a lot but have done the old master's technique of transparent glazing that I learned from Patricia Whitty. It is a very beautiful technique and I do like the result but it is very labor intensive and time consuming and I think it would be fun to finish a painting in a sitting so that you could travel and do oil instead of just watercolor. I went to the Bayou City Art Fest in downtown Houston on Saturday with my friend Angela. 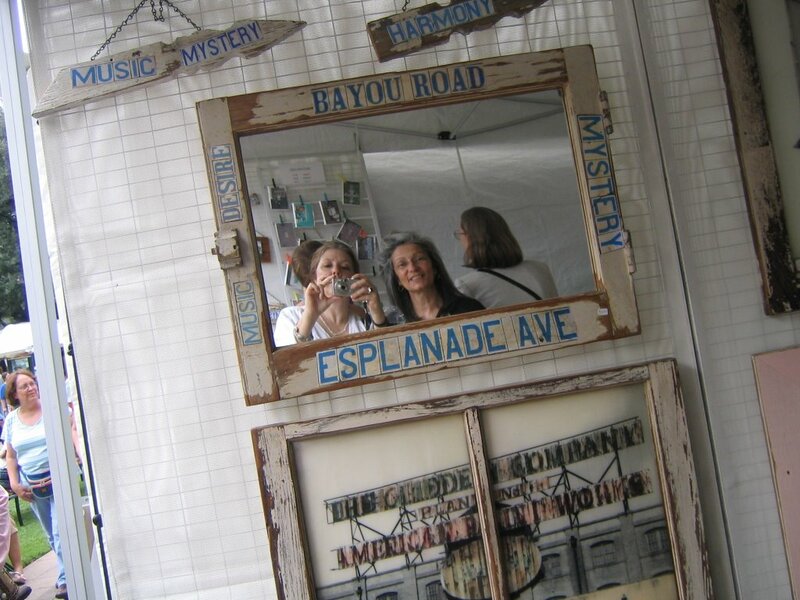 Here we are reflected in the mirror. 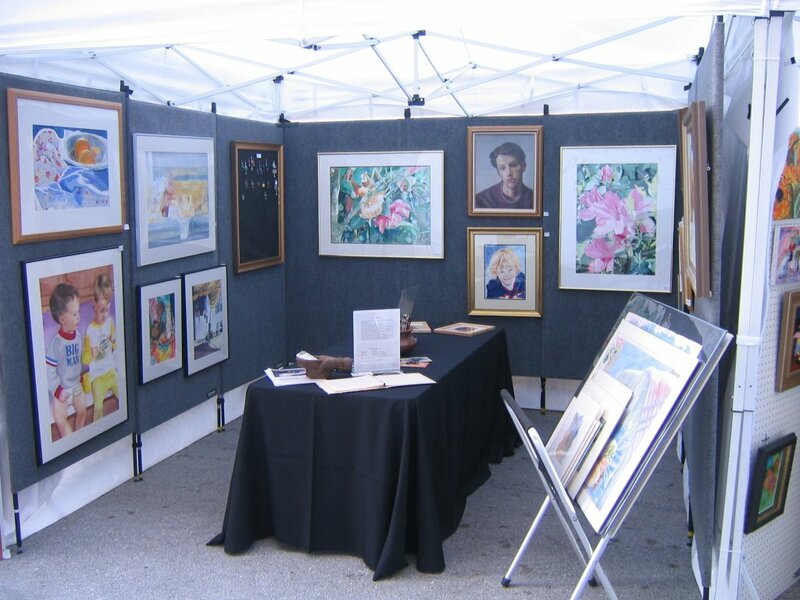 We had a great time and met some fun artists. What a beautiful setting for the art fest too! 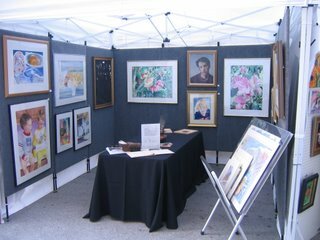 Here is a photo of my booth at the art show this weekend. 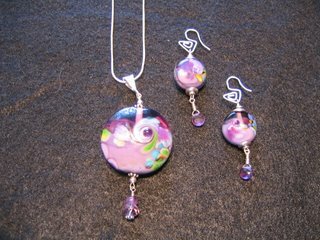 I had a lot of fun, sold paintings and lampwork jewelry and met a lot of really nice people. It's a beautiful day today and finally a little cool. 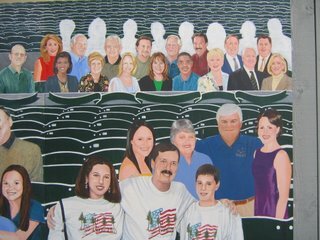 I should be working on this mural at the Cynthia Mitchel Pavillion here in The Woodlands, but it is Monday and I have so much other catching up stuff to do today. I will probably go tomorrow morning. 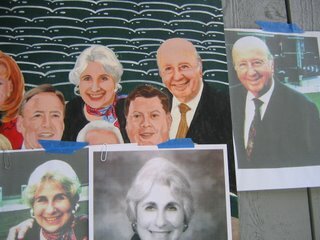 These are some of the "hometown heroes" and this particular photo shows the Mitchels themselves. It is a big project and I have two more in this line that are unfinished and then they are also adding two more that I haven't even gotten the photos for yet. There are also some private portraits that are going up on the other end that I have only gotten the white base painted for. I will try to find a photo of that. 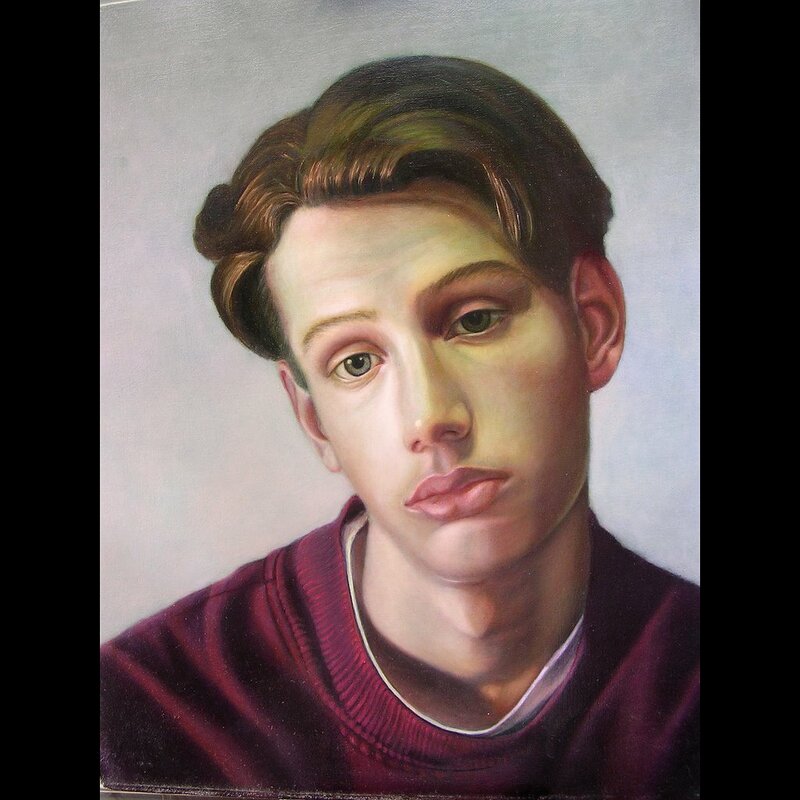 Here is a photo of one of the private portraits in the transfer stage. I use clear plastic to lay over the original drawing and then trace with permenant marker. I tape this up and then slip some transfer paper behind it and trace it off. The clear plastic has been a real breakthrough because it is so much easier to place the new figures between others that have already been done. After I trace them on the wall, I then fill in the outline with geso for several coats sanding in between coats to get a nice smooth surface to paint on. This also covers the dark underlying green. 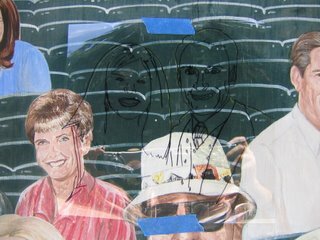 When that's done I can then easily put the clear plastic tracing back up and align it and trace off the details to begin the portrait. Here is a view of the Hometown heros for this year in the geso stage. The head sizes on those are 3 inches. The closest people in the front in white shirts with flags are 7 inch heads. 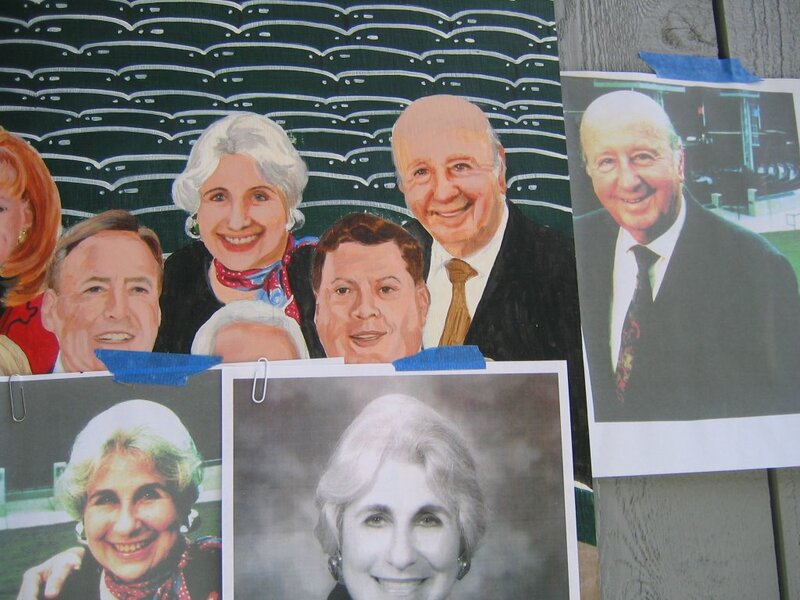 The Home town heros are high enough up that I have to use a stepstool ladder to stand on to paint them. 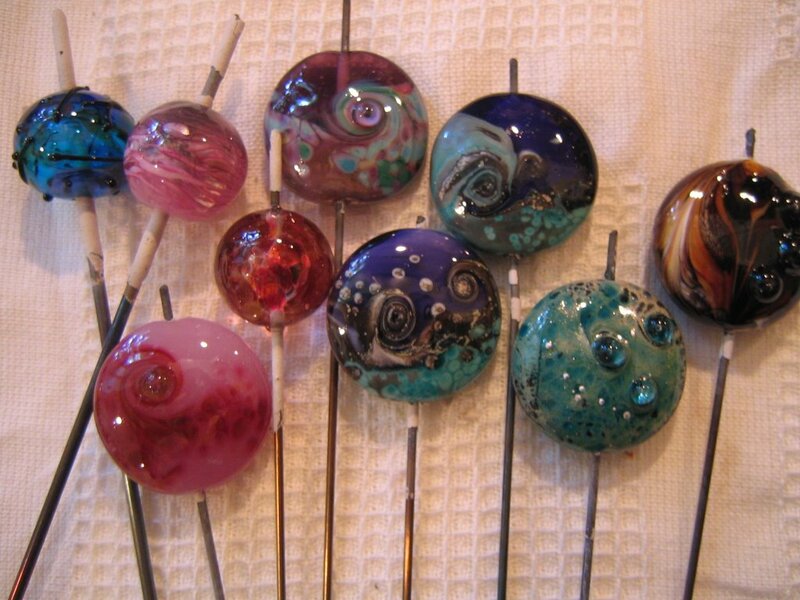 Here are some beads just out of the kiln before they have been taken off the mandrels. Three hollow ones and the rest are pressed with the Zoozii's Large Straight sided lentil plus press. 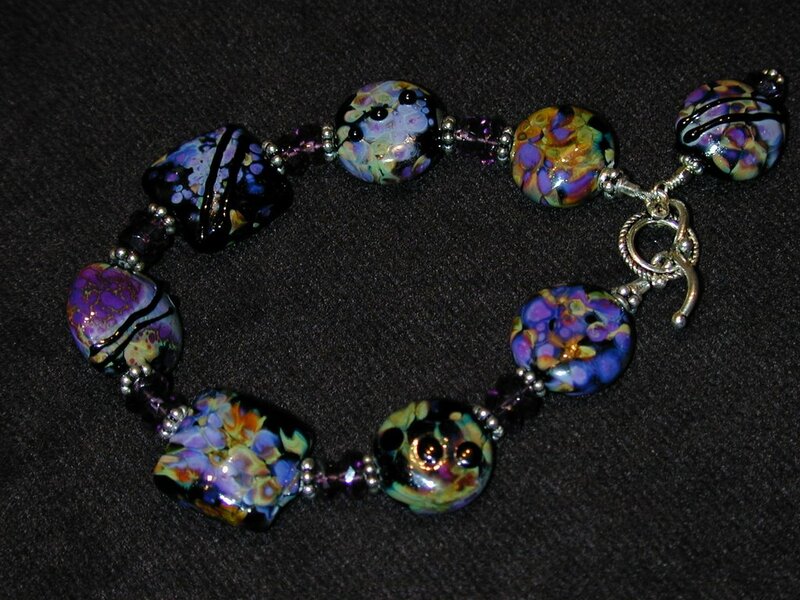 I have been making glass beads for about 10 years or so. I learned from Marilyn Bennekers, an Artist in Slidell Louisiana. 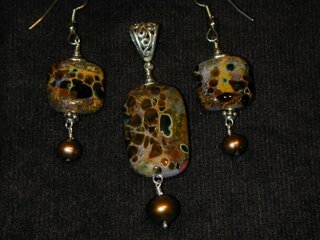 I have reciently gotten a new Bobcat torch and am making more and bigger beads than I used to. I try to make beads a few times a week. 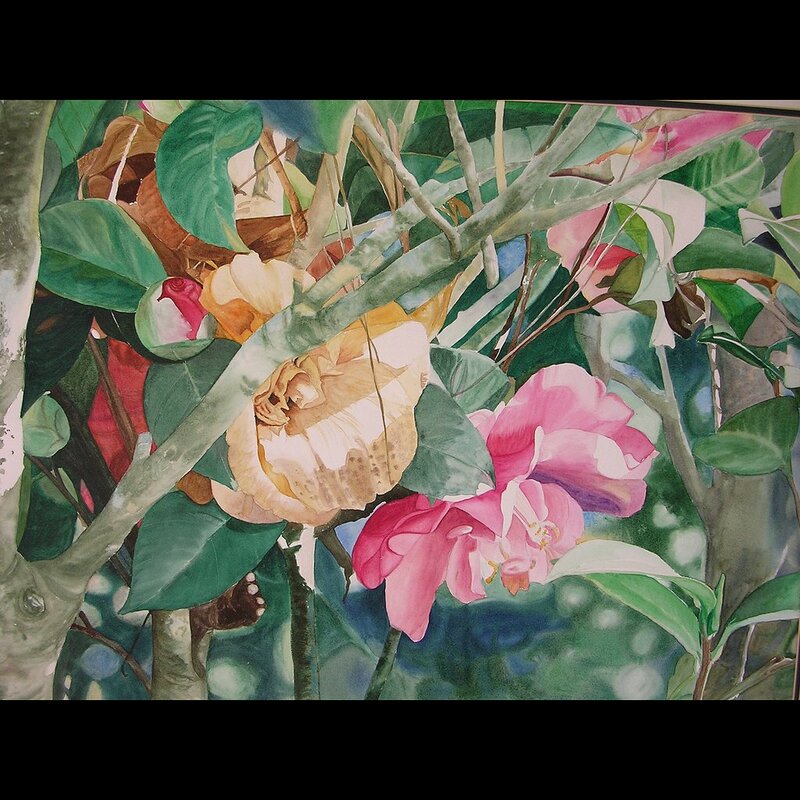 This is the watercolor painting I'm working on right now. 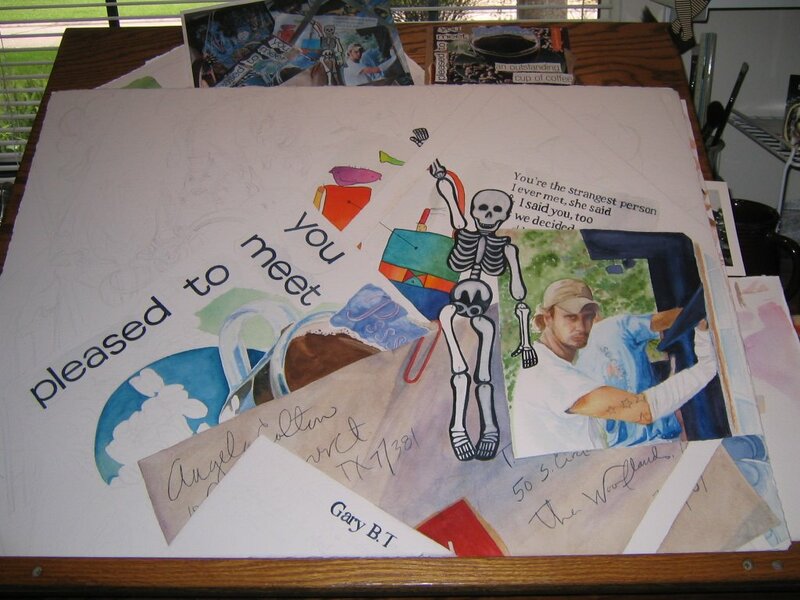 It's a painting of a "collage" of stuff that was on my bulliten board at the time. It has been tedious to work on due to all the lettering it has in it. 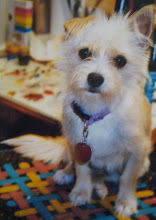 I am working from the photo that you can see at the top of the picture. I have a street show coming up on the 7th of October, so am hoping to have it finished by then. 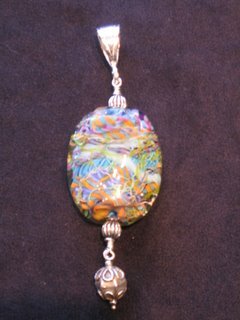 Lampwork glass bead making is another one of my art mediums and I just taught an all day seminar at the local college yesterday. 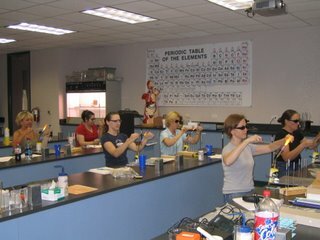 We set up hothead torches in the lab because it has built in ventilation. I had six students yesterday as one didn't show up. We have seven torches and usually fill up the class. They did very well and caught on quickly. Here is a not so great photo of one of my jewelry creations from my own glass beads that I have made. I need to work on my photo skills.